Since 1983, Gloria Gomez-Mena Marina & Susan Perry Fuhrman have been connecting home sellers and buyers in and around Coral Gables, Coconut Grove, South Miami and Pinecrest. 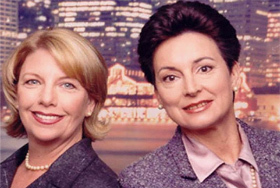 Unlike the horde of real estate agents who jumped into the profession during the recent boom (and were hard hit by the ensuing bust), Gloria and Susan are seasoned experts with experience navigating the inevitable ups and downs of the real estate market. They have not only survived but thrived through several real estate cycles by consistently delivering great results to clients. Gloria, an intellectual at heart, holds a PhD from Columbia in History and Masters Degrees in both Philosophy and History. A certified translator fluent in 5 languages (Spanish, English, French, Italian and German “plus a little ‘Portañol’”), Gloria particularly enjoys working with European sellers, buyers and investors. And they love working with her because she is able to fully understand their needs and advise them on everything from complex real estate law, to evaluating ROI, to the tax benefits and implications of buying and selling… all in their language. Speaking 5 languages is one thing, speaking real estate – fluently – in 5 languages is quite another. Gloria also enjoys working with older couples and empty nesters. As an ex-reporter, she has a nose for research and “digging up the dirt,” which comes in handy when helping clients evaluate opportunities and make sound decisions. Those ex-reporter writing skills also help her craft headlines and listings that grab attention and get buyers in the door. Despite the impressive resumes and years of experience, Gloria and Susan are down-to-earth, fun, energetic… and just a touch irreverent. Plus they love what they do and are committed to the community in which they live and work (by the way, they know all about the best schools too, their own children went to Sunset Elementary, Ransom Everglades and Columbus). Working with them is easy, enjoyable and, of course, profitable for their clients… who keep coming back. Consider this: nearly 100% of Gloria and Susan’s listings are either repeat business or word-of-mouth referrals. While most real estate agents rely on advertising and marketing to grow their business. Gloria and Susan rely on excellent results and satisfied clients to grow theirs. When selling or buying a home in Coral Gables, Coconut Grove, South Miami or Pinecrest, contact Gloria and Susan. They care about building long-term relationships and generating referrals, so they always act in your best interests, and will give you the personal attention, guidance and results you seek.